The Residence, on the upper-deck forward cabin of its Airbus A380 aircraft, comes complete with butler, double bedroom, living room and en suite shower. Staking claim to flying the first “boutique hotel” in the air, its A380s will also feature nine “First Apartments” to replace its current First Class Suites. The new private suites will feature a full-length bed, mini-bar, vanity and wardrobe. 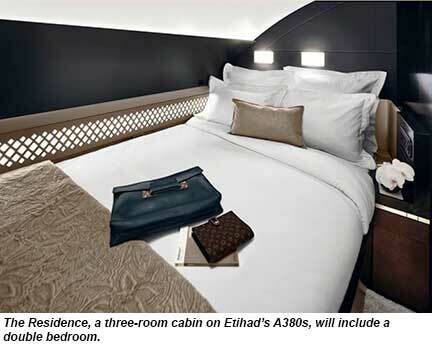 A variation of the First Apartment will be on Etihad’s Boeing 787 Dreamliners. Other cabins have been renamed and enhanced as well. Business class has been dubbed the Business Studio; those in the back of the plane will fly Economy Smart Seat. Both cabins will feature Panasonic eX3 entertainment systems with 750 hours of on-demand entertainment, gaming and high-definition screens. Noise canceling headsets will be provided to all passengers. The A380 aircraft will have full mobile and WiFi service, while the 787 will be equipped with WiFi. The Residence has been certified by the European Aviation Safety Agency for single or double occupancy, the company said. Etihad said a new interior aesthetic embraces “Arabian Modernism,” which combines the traditions of the region with contemporary design. Each Etihad A380 will offer versions of the Residence with different color palettes, table marquetry and custom carpets. Onboard butlers will have received “specialist training” at the Savoy Butler Academy in London. Residence passengers will further have a “dedicated VIP Travel Concierge team who will ensure every detail of their travel experience — including ground transport, cuisine and amenities — are tailored to their requirements,” Etihad said. On the 787, eight First Suites will be deployed in a 1-2-1 configuration along a curved aisle, which the airline says is a first in commercial aviation. Business Studios on both aircraft types will provide 20% more personal space than the airline’s current business class seat in a 1-2-1 configuration in a forward and aft “dovetail” design. All will have aisle access, and the seat converts into a fully flat bed of up to 80.5 inches. On the Airbus A380, all premium-class passengers will have access to the Lobby, a serviced lounge and bar area located between the first and business cabins. It includes a semicircular leather sofa, a marquetry table and a large TV screen. The Economy Smart Seat will offer an ergonomic fixed-wing headrest and a lumbar support feature. The boarding process will be “transformed, making it more akin to stepping into the lobby of a boutique hotel,” the airline said. Galley equipment will be concealed behind custom Arabic fretwork screens and blinds, while the trolleys will be covered by wood-finish doors. Premium class boarding areas will exhibit artwork and artifacts from United Arab Emirates cultural institutions. Also, items from the duty free catalog will be displayed. The aircraft will feature prayer areas, which can be curtained off, and are equipped with a real-time electronic Qibla-finder showing the exact direction of Mecca based on the aircraft’s geographical position. The airline said it will also update its dining equipment, amenities and soft furnishings across its entire fleet. No date was provided for when the fleet enhancements will be available. Sandals Resorts International set to make double debut in BarbadosBRIDGETOWN, Barbados — Sandals Resorts International (SRI), parent company of Sandals Resorts, Beaches Resorts and Grand Pineapple Beach Resorts, praised the Government of Barbados following the announcement of a deal which will result in opening of two resorts in the country. SRI and the Government of Barbados reached the agreement following months of negotiations that will see the Caribbean’s leading resort company open the former Couples resort in St. Lawrence as a Sandals resort as well as managing a new Beaches resort set to be built on the site of the former Almond Beach resort in St. Peter. According to Sandals Resorts’ Chairman, Gordon ‘Butch’ Stewart, the 10-acre former Couples property will open as a Sandals Luxury Included resort and will honour all existing commitments with guests who had booked to stay at Couples up until Nov. 6, 2013. Stewart commented, “We are delighted to announce the opening of, not one, but two of our first ever resorts in this wonderful country of Barbados. Barbados and its people are so rich in culture, charm and personality and have been one of the leaders in Caribbean tourism for decades. We have been in discussions to bring our award-winning brands to this country for some time and are thrilled that negotiations have now been successfully concluded. In addition to the opening of Sandals Barbados, SRI also announced that an agreement has been reached with the Government of Barbados regarding the building of a brand new Beaches resort at the site of former Almond Beach resort in St. Peter, Barbados. “Since it first launched over 16 years ago, Beaches has captured the hearts and minds of vacationers everywhere and I can assure you that what we’re planning in Barbados will become one of the most sought after resorts in the entire world. 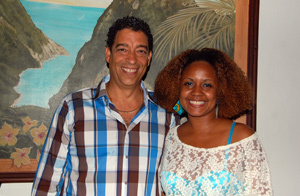 From Sandals Resorts International, Jeremy Jones, Regional Director, Eastern Caribbean, and Rhonda Giraudy, PR Manager, during a recent press trip at Sandals La Toc in St. Lucia. During a recent press trip to view Sandals properties in Antigua and St. Lucia, Travelweek learned about upcoming plans to debut a new resort in Barbados. According to Jones, along with the acquisition of Sandals La Toc in St. Lucia 22 years ago from previous owner Cunard Cruise Line, Sandals also acquired the licence to expand in Barbados where plans for a new property will finally come to fruition in 2015. The company is currently in discussions with investors and an official announcement is expected in December. If that wasn’t enough to keep Jones busy, he’s also heading up the development and grand opening of LaSource Grenada, also in December. “We’re on schedule for LaSource with management staff all hired. Last week we recruited 500 line positions after interviewing 1,940 people. Orientation will start later this month,” he said. Expected to be Sandals’ most luxurious property yet and its first new build in 10 years, LaSource Grenada will feature 225 rooms, infinity pool, lagoon and nine restaurants that will incorporate the many local spices that the island is known for. As such, the buzz about the property has been steadily building; it is currently the company’s fastest selling hotel with a 93% occupancy rate for the first five months of 2014. Not to be outdone, however, is Sandals Grande St. Lucian Spa & Beach Resort, which will proceed with the development of 15 overwater bungalows early next year. As the Caribbean’s first ever overwater bungalows and the property’s top room category, the new rooms are expected to bring a new level of luxury to both St. Lucia and the brand. The bungalows are part of a US$80 million renovation at the Grande, which will also see the addition of 185 rooms and four new restaurants. Painstaking measures are being taken to minimize the eco-impact of these bungalows; the company is working with three marine biologists (one from St. Lucia and two from Germany) to ensure all necessary precautions are met. “We have approval to build but we first want to make sure we don’t have a negative impact on the environment. We have to be conscious of the impact it has on the community, society and the people who live there,” he added. Jones pointed to the island’s coastal design as the reason why Sandals chose St. Lucia to debut its first overwater bungalows. With the upcoming development project, he’s confident that the Grande will continue to be the company’s best-selling property in the region. Following closely behind is Sandals Halcyon Beach St. Lucia, which Jones noted has the region’s highest repeat business. “While an agreement is yet to be finalized, commitments have been made on both sides and we are thrilled at the possibility of bringing the award-winning Beaches brand to this wonderful country. We are a Caribbean company and firmly believe that no one understands the needs of the region or its people like we do,” said a statement. MIAMI — Carnival Cruise Lines has unveiled an unprecedented new program that offers consumers a one-of-a-kind, hassle-free money-back guarantee when booking a Carnival cruise vacation. Designed to provide consumers with complete peace of mind, the ‘Great Vacation Guarantee’ allows guests to end their voyage early and receive a 110% refund plus complimentary transportation home, along with a $100 shipboard credit for a future cruise, should they be dissatisfied with their cruise for any reason. Commissions on the refunded cruise are protected and Carnival will make all return travel arrangements, including flights and hotel/ground transfers as needed, for those guests who exercise the Great Vacation Guarantee. To exercise the ‘Great Vacation Guarantee’, guests simply notify the ship’s guest services desk within the first 24 hours of the voyage to receive a full refund of their cruise fare plus an additional 10%, along with complimentary return air transportation from the next port of call, and complimentary ground transportation and hotel accommodations (if necessary), along with a $100 shipboard credit to be used on a future Carnival cruise. Carnival will fully handle all the necessary travel arrangements to make it a truly hassle-free experience. The ‘Great Vacation Guarantee’ is valid on all three- to eight-day voyages to The Bahamas, Caribbean, Mexican Riviera, Alaska, Canada and New England departing through April 30, 2015. The program applies to U.S. and Canadian residents only and guests must possess a valid passport to return by air. Carnival is promoting the ‘Great Vacation Guarantee’ through its travel agent partners, as well as a special section on its website at carnival.com/vacationguarantee and through ads in major market newspapers and online. Guests of Sandals Grande Antigua Resort & Spa will soon enjoy the new VIP treatment known as Club Sandals beginning September 1, 2013. Following successful launches at all Sandals Resorts in Jamaica and the Bahamas, the “World’s Leading Honeymoon Resort” in Antigua will soon offer concierge level guests more Luxury Included® amenities and enhanced service so that they may enjoy their stay in exotic Antigua virtually carefree. Upon arrival, concierge guests are whisked to the exclusive Club Sandals Lounge where they are welcomed by a Club Sandals Concierge and a signature cocktail during their private check-in. Available twenty-four hours a day, seven days a week, the private Club Sandals Lounge offers a variety of complimentary features including iPads and Kindles loaded with popular reads, snacks and beverages, soothing music and more. Club Sandals Concierges are also on-hand throughout the day to add personalized service that can truly make a difference to any Sandals Resorts vacation, from assisting in spa and dinner reservations to providing access to the daily New York Times every morning with coffee. Members are also invited to weekly activities including exclusive wine tastings and snorkeling excursions. Personalized Island Routes Caribbean Adventures tours are also available to guests looking to experience the natural beauty of Antigua with their significant other. Club Sandals will make its fourth debut at all three Sandals Resorts in Saint Lucia on October 1, 2013. The CNN quotes, “With its luminous body seemingly hovering above the water, and five spidery legs plunging deep into the sea, this futuristic building could be the mother ship in a sci-fi film.” Well folks, we are talking about the world’s largest underwater hotel: ‘The Water Discus Hotel’.Located in tropical island of Kuredhivaru in the Maldives, this under construction luxury multi-million dollar resort will feature 21 moveable rooms located underwater. “There are many people who will never have the courage to dive to these beautiful reefs. But here you will have the chance to explore an underwater world from the comfort of your bedroom.” says hotel designer, Pawel Podwojewski, to CNN. Described as “Star Trek meets the undersea world of Jacques Cousteau,” this outstanding structure is worth $50 million. The unique super structure is the brainchild of Polish company Deep Ocean Technology.The illuminating hotel features two large disc-shaped lounges seven-meters above the sea, housing a luxury restaurant and spa. The lounges are connected to a glass tunnel plunging 30-meters below water leading to the spacious bedrooms. This ultra unique spaceship may be stationed deep in the ocean but its luxury facilities reach the sky that includes a helicopter landing pad and a rooftop swimming pool. Guests can sit back and enjoy views of the vivacious reefs and marine life under water, all from the comfort of their bed. The hotel also provides guided diving facilities where guests can dive straight from the hotel’s airlock compartment, including its own decompression chamber. The more adventurous ones can take a ride in a three-passenger deep-sea submarine. The builders have also taken specific measures to sustain the surrounding ecosystem. “To preserve the natural environment we have developed couple of kinds of foundations depending on the local conditions,” said Podwojewski. Talk about sleeping with the fishes. Look out of the Water Discus Hotel and all you see is ocean—not just on the horizon, but all around you. Like a spaceship that sits on a coral reef, with underwater rooms that put you eye to eye with the creatures of the deep, this newest in ultra-luxury resorts is coming to the Maldives, and reportedly to Dubai as well. The brainchild of Polish company Deep Ocean Technology, backed by Swiss investors, the Water Discus is made up of two big discs, one above the water and one below, that stand on five legs like a giant spider. The lower disc has 21 hotel rooms, an underwater dive center, and a bar and restaurant. There’s even a helicopter pad and a rooftop swimming pool. “We bring you a de luxe hotel combined with a real marine adventure and breathtaking views found only in the heart of the ocean,” the hotel company says. Feeling a little queasy already? Not to worry. “A wide shaft with a view of the sky above gives a safe sense of spaciousness, minimizing any claustrophobic feelings some may experience while staying in an enclosed underwater space,” it adds. Water sports are available, of course. There are diving lessons and underwater scooters. The dive center is equipped with an underwater airlock, so guests can jump straight into the ocean, and a decompression chamber for trainingand deep-diving excursions. On the surface you can rent three-passenger submersibles, motor boats for diving and water-skiing, and fast jet skis. The whole complex sits on a coral reef, with outdoor lighting so guests can see the amazing sights. And to make sure the fish don’t stare back, the rooms are soundproof and curtained. The lobby, built inside an enormous swimming pool, is connected to the satellites by glass-walled tunnels and an exotic garden. The National Ministry of Tourism has given permission for the first hotel to be built on the secluded tropical island of Kuredhivaru in the Maldive Islands, and negotiations are underway in Dubai to build one of the surreal structures as well.